The Rising Earth Signature is our most popular treatment. It is an integrated therapeutic massage that combines a variety of techniques and pressure specific to the body’s needs. Techniques used can be swedish, deep tissue, sports, myofascial release techniques, reflexology, specific aromatherapy and stretching or trigger point therapy. If you are a deep tissue or sports massage lover this massage is for you! The use of essential oils, hot stones and hot towels makes this therapeutic treatment extremely relaxing. Experience the best of “all” worlds! The session is not a massage. It focus’ on stretching major muscle groups in the body. It is performed with loose fitting clothing. The benefits of stretching can be felt throughout the body. It helps stimulate the digestive organs, reduces inflammation in joints, relieves tension, improves concentration, improves posture, and energizes the body. Relax together with a massage! Two people receive massage at the same time in the same or separate rooms. This session can be enjoyed by spouses, partners, sisters, or anyone you’d like to enjoy quiet time with. Use of Swedish massage techniques are specifically tailored for the expectant mother’s needs. This massage promotes relaxation and helps Mom from suffering with low back pain, tense muscles and swelling often related to edema. A deeply relaxing treatment that uses application of pressure points to the feet and sometimes the hands to bring the body back into balance. The science of Reflexology targets the reflexes instead of working directly on the corresponding body part. Reflexology has been proven to increase circulation & blood flow, reduce pain, stimulate of the nervous system, reduce stress, provide headache and sinus relief aid in digestive problems and provide better sleep! Myofascial Release (MFR) is soft tissue manual therapy for the treatment of muscle immobility & pain. Firm but gentle pressure is used to release tightness in muscles. MFR, is one of the most effective methods for relieving pain, restoring posture, and returning one to function. Myofascial Release is a hands-on technique that provides sustained pressure into myofascial restrictions (tightness, scar tissue, injured areas) to eliminate pain and restore motion. It’s been proven effective for chronic pain. This treatment is performed directly on skin without oils, creams or lotions, with the client clothed in shorts and a sports bra or tank top. This allows the therapist to accurately detect fascial restrictions and apply the appropriate amount of sustained pressure to facilitate release of the fascia. 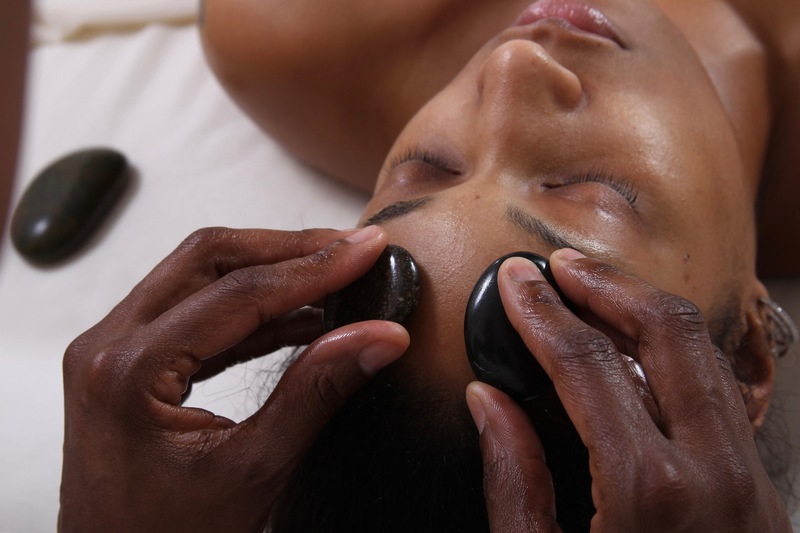 A combination of Swedish massage and smooth hot basalt stones provide deep heat therapy. This treatment relieves tension in tight muscles, releases toxins and improves circulation. Customize your treatment with your favorite essential oil! THIS SERVICE IS ONLY AVAILABLE FOR BOOKING SEPTEMBER 30TH – MAY 1ST. PLEASE CONSIDER LAVA SHELL MASSAGE DURING THE SUMMER MONTHS OR CALL TO SCHEDULE IF YOU HAVE A PACKAGE OR GIFT CERTIFICATE FOR THIS SERVICE AND NEED TO SCHEDULE DURING THE SUMMER MONTHS! Lava Shells are the World’s first self heating massage tool. A unique innovation in warming therapies that relaxes while easing muscle and joint aches and pains. Offering the benefits of a hot stone massage but with an added bonus of being eco friendly, the Lava Shell Massage therapy uses 100% genuine recycled Tiger Clam* Shells which are sourced from the Philippines. A mixture of minerals, algae, salt water and essential oils is placed inside the pink, striped clam causing a chemical reaction which produces heat allowing therapists to provide a continuous and seamless body massage. Chair Massage & Massage Parties ~ Call for information about our off-site services.